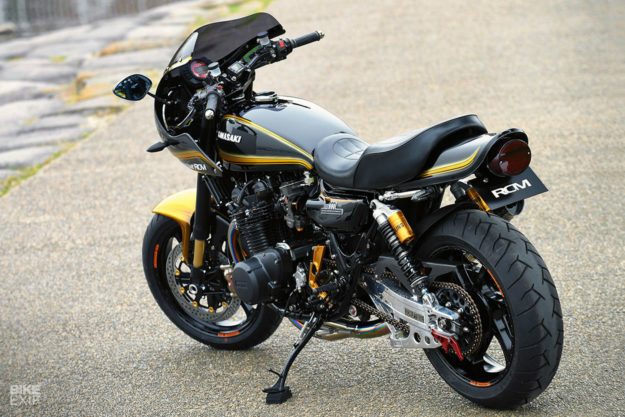 The new Kawasaki Z900RS had barely broken cover when custom examples started popping up. 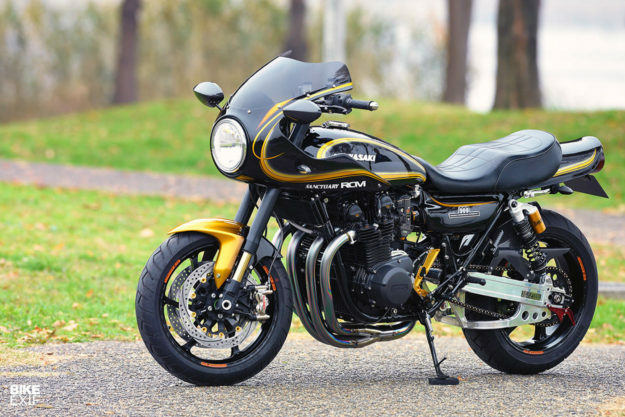 First Kawasaki Japan commissioned three builds from local workshops, then Kawasaki Australia handed one over to veterans Deus. But there’s one name that’s curiously missing from the list: AC Sanctuary. 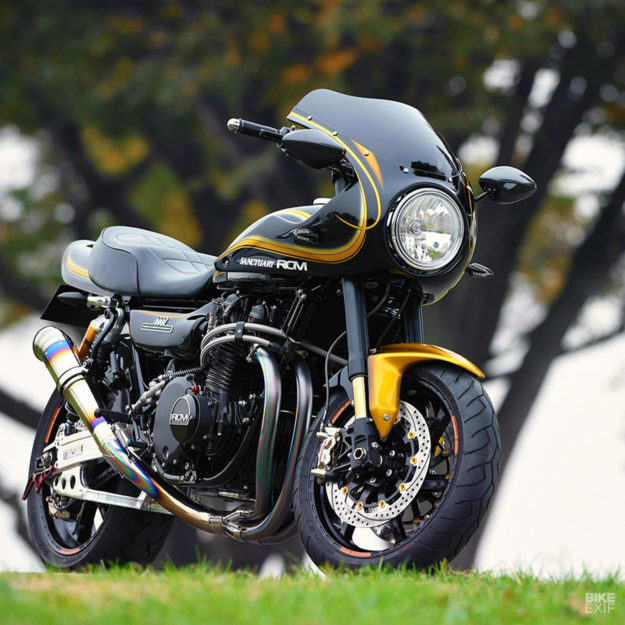 The enigmatic Japanese powerhouse has proven time and time again that if anyone knows how to restomod a vintage Zed, it’s them. If we had a direct line to Kawasaki Motors, we’d tell them to get a bike over to AC Sanctuary, pronto. 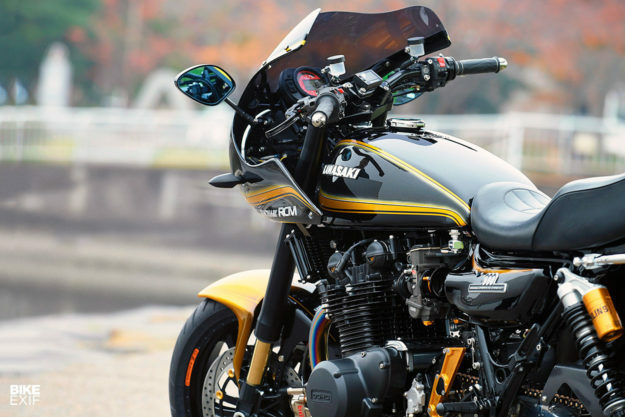 And we’d use this show-stopping 1970s Kawasaki Z1 to plead our case. Numbered RCM-431, it was built for a client in Tochigi Prefecture, north of Tokyo. He already owns a newer Zephyr 1100, so the AC crew knew that they’d need to step up the older Zed’s performance to match. 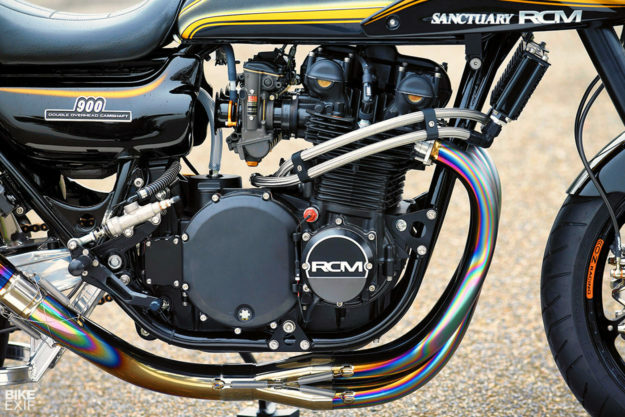 Luckily ‘RCM’ stands for ‘Real Complete Machine’—so this Kawa’s had every upgrade imaginable thrown at it. One of the client’s top requests was that Sanctuary install a frame-mounted bikini fairing from American Dream. 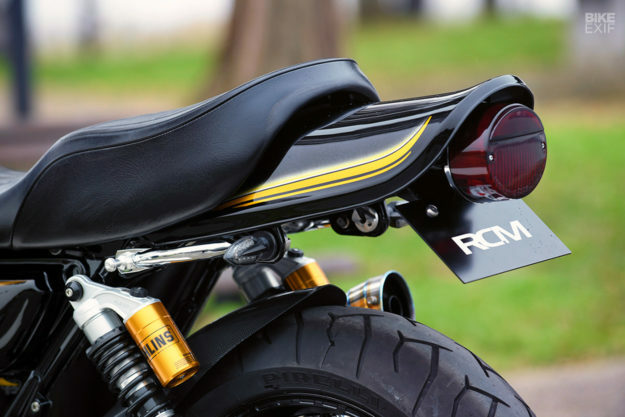 But he also wanted a more comfortable position than clip-ons would provide, so the guys had to mount the fairing high enough to interface with a pair of low-rise handlebars. Everything now fits with millimeter precision, with rubber mounts added to damp any fairing vibration at speed. The bars are superbike items from POSH Japan, and there’s a digital speedo tucked behind the new screen. Functional items like turn signals and mirrors have all been updated to modern equivalents. Poking out of the fairing is a significantly improved front end. 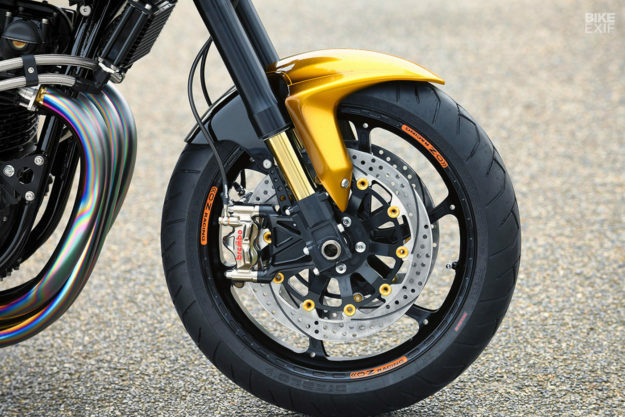 New triples hold a set of Öhlins FG 424 Road & Track inverted forks, connected to an OZ Racing wheel. There’s a new twin-disc brake setup, cobbled together with Brembo radial calipers, a Brembo master cylinder, SMB caliper brackets, Sunstar discs and Allegri hoses. The rear end’s looking just as fresh—with a pair of Öhlins Legend twin shocks connected to a polished Sculpture ‘wide’ swing arm. The extra width’s there to accommodate a 5.5-wide OZ Racing wheel, and both wheels are shod with grippy Pirelli Diablos. The rear brake setup’s pretty similar to the front, with the exception of a Nissin master cylinder. Sanctuary make the rear end conversion look easy, but in reality it’s anything but. You’re looking at everything from basics like new sprockets, chain and chain slider; to frame mods that cater for the offset. The frame’s been reinforced too, and treated to a swanky DLC (Diamond-Like Carbon) coating. There’s enough going on under the hood to make sure this Zed has the ‘go’ to match its ‘show.’ Even though it says ‘900’ on the side, the engine’s been taken to 1,165 cc with a set of Wossner pistons. The rebuild was extensive, covering everything from honing the cylinders to balancing the crank. The Kawasaki’s had some head work done too, and now runs with PAMS HF valves and a Kent cam. And when Sanctuary put the engine back together, they did so with a full set of chromoly fasteners. You can also spot a new cooling system from Earls, with its beefy plumbing neatly running around the engine. 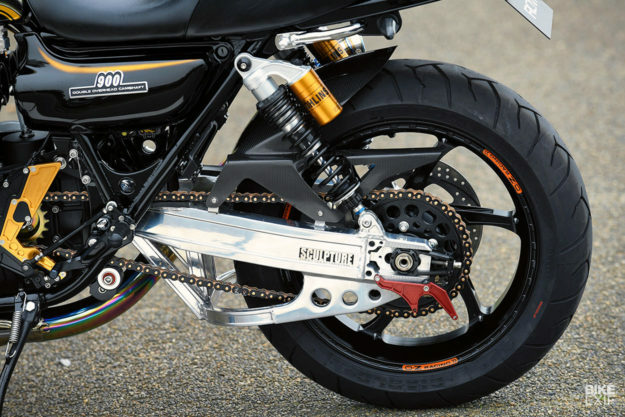 And the clutch has been upgraded to a hydraulic system, with a Z1000 Police-spec clutch cover, and Allegri lines connected to a Brembo master cylinder. Sanctuary switched the carbs out for a row of 38mm Yoshimura Mikunis, breathing through velocity stacks. 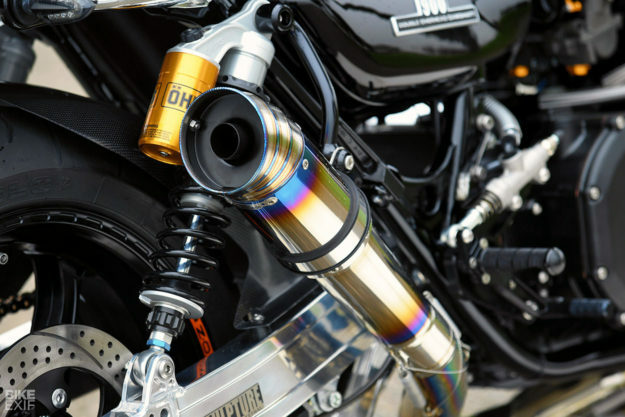 A four-into-one titanium exhaust system from Nitro Racing flows exquisitely into a heat-polished ‘muffler’ from Grenade. There are a few more tasty Nitro Racing parts sprinkled throughout this build, including the rear sets, passenger pegs, front fender and sprocket cover. The line between classy and kitsch is very fine when you’re working with gold, but AC Sanctuary have nailed the Z1’s livery. 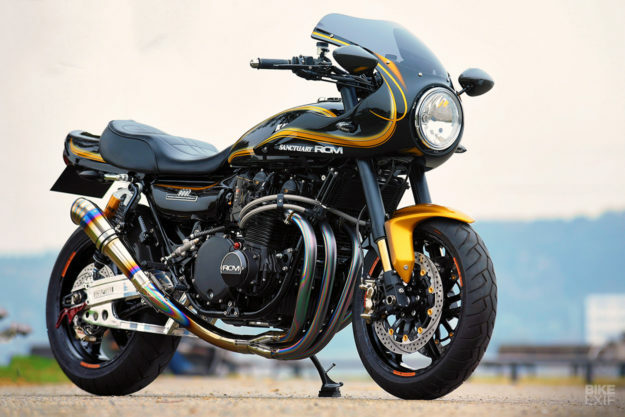 Every last finish on every last part of this Kawasaki has been thought of, with tasteful gold touches lurking everywhere, and an engine coating so clean you could eat off it. 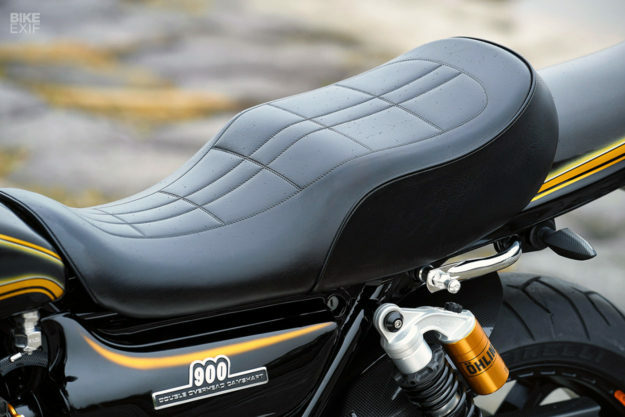 Combined with the big four’s iconic oversized seat and tail section, it creates an old school vibe with a better-than-factory effect. Which is what AC Sanctuary excel at. Isn’t it about time they got that call from Kawasaki?